Just a few days after the start of ITMA 2015, KARL MAYER gives a successful preliminary résumé. Already upon opening the exhibition on 12. 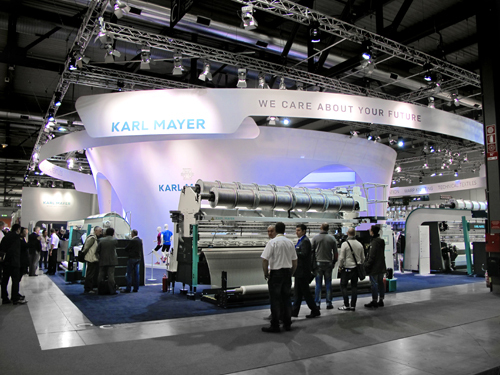 November KARL MAYER’s Stand C101 in Hall 5 turned out to be the meeting point of the entire warp-knitting and warp-preparation branch par excellence. A lively hustle and bustle could be observed on the KARL MAYER stand. The visitors not only came in crowds, they had specific concerns and showed great interest. „The first two exhibition days have exceeded our expectations not only in terms of the visitor frequency but also concerning the high quality of the talks“, explained Oliver Mathews, Sales Vice President of the Warp Knitting Business Unit. His positive summary was confirmed by the KARL MAYER Business Units Warp Preparation and Technical Textiles. Until Saturday, 14. November, the Karl Mayer team had roughly 670 qualified customer conversations. The clients came from 38 countries. The leading countries of origin of the exhibitors were India, China, Turkey and Italy. The visitors were mainly interested in the new tricot machines presented by Karl Mayer. While the HKS 2-SE machine was very convincing especially by its Low Energy Option (LEO), the HKS 4-M EL deeply impressed the public by its flexibility during pattern change made possible by the EL equipment. Concerning the Warp Preparation unit, the new allround sectional warper PRO WARP® and the extra-wide MULTI-MATIC® MM 128/3.600 have been pulling the crowds. Moreover, KARL MAYER’s new WEFTTRONIC® HKS for the production of semi-technical articles of completely new style was also topic of numerous discussions. The platform for these innovative exhibits is a stand with a futuristic design and multimedia show which leaves a lasting impression on the public. Already from a distance it attracts not only the attention but also the visitors – and this will surely continue in the next few days.